Presenting an extremely rare example of a true Centenarian amulet, the Nang Kwak Supawadee alchemical metal Loi Ongk Statuette forged from sorcerous brazen metal artifacts, from Luang Por Im, of Wat Hua Khao, measuring 2.0 Cm. 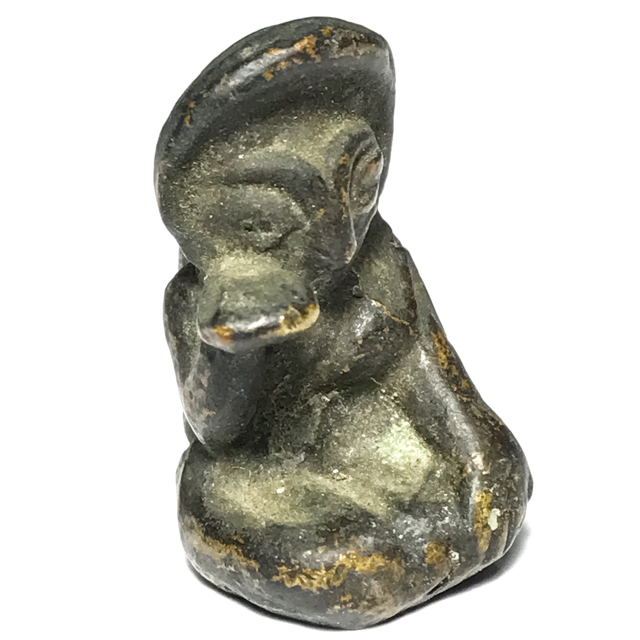 The Nang Kwak of Luang Por Im is known to be a Powerful Khmer Wicha for good business and mercy charm, and is one of the major protagonists of the Kaa Khaay (sale increase) category of amulets, of the previous century. The amulet was made sometime around 2460 - 2365 BE. The Pra Nang Kwak Supawadee Loi Ongk Statuette Alchemical Substance ring is very old and rare, and is famous for its protective power against Dangers, Black Magic and Maha Pokasap to attract and retain wealth and treasures. This ring is a 'Niyom' class preferred amulet, of the finest artisanship. Luang Phu Im made various models of magic rings, some of them of simple design, with thinner metal, and others with finely designed decorative designs in heavier cast metal. Nang Gwak is one of Thailands most commonly seen Deities. Her image is given offerings and prayed to, in order to increase wealth and business prosperity. She is a Deity revered by Merchants in both India and Thailand, by both Brahman, and Buddhists alike. Nang Gwak is the helper of all shop-owners and merchants. She is normally seen placed on a high shelf (normally a wooden or red and gold lintel, called ‘Hing’ in Thai) and offered “Nam Daeng” (a red syrupy drink, often used in Bucha offerings to Deities in Thai Buddhist practice). Also, Incense, and flower garlands are offered to please Nang Gwak, and bring customers and make sales. Kata Nang Gwak is used when paying devotional merits to Nang Gwak, who is used in the place of business to increase the amount of customers and sales you may ingress. Nang Gwak is a very popular magic cloth Yantra used in most business establishments in Thailand. You can also see Nang Gwak worshiped as a statue . To Bucha Nang Gwak, One should use 5 incense sticks and offer flowers (preferably jasmine), red syrup drink (‘Nam Daeng’). Some water, and also some sweets and rice as offerings. Light the incense, candles, and offer the flowers and drinks. Then Say “Namo Dtassa Pakawadto Arahadto Sammaa Samputtassa” 3 times, and bow three times to Buddha before you begin chanting Kata Nang Gwak.